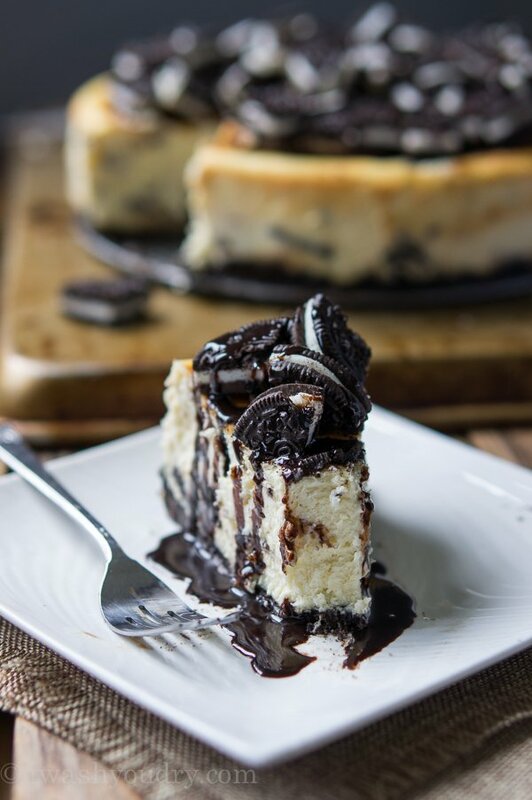 This Oreo Cheesecake boasts a buttery crisp Oreo cookie crust, a thick luscious layer of creamy cheesecake that’s infused with even more chocolate and cream cookie bits, then it’s topped off with what can only be considered a glorious pile of chopped Oreos. Let me start off by saying 9 year olds are tricky. I question her, wondering how on Earth she would come to this conclusion. Then she unclenches her tiny fist to reveal a little tooth. Apparently she had pulled out her tooth the night before, sneakily stuck it under her pillow, and waited till morning. Only to be disappointed when she saw the tooth still there. I quickly explain to her that she is supposed to place it in the special “Tooth Fairy Bag” that I constructed, which hangs on her door knob. So the Tooth Fairy must have not realized there was a tooth to pick up and passed by our house. Friday night comes around and my daughter places her tooth in the bag, hangs it on her door knob, and goes off to sleep. My husband and I start to watch a movie and the next thing you know we are sleepily walking to our beds. Then I remember – the tooth! I go to the coin jar in the kitchen, fumble around trying to find a Loonie. Side note- a Loonie is a Canadian dollar coin, which is gold in color and slightly larger than a quarter. After the deed is done I slip off to sleep, only to be rudely awaken first thing in the morning by an angry 9 year old. My 9 year old did not appreciate the token, since there are zero Chuck E Cheese’s within a 1000 mile radius of us. So… we had a little heart to heart and I explained that the Tooth Fairy was only playing a joke on her because she tried to trick her the first night by hiding the tooth under her pillow. Then I promised her she could have an extra large slice of this Oreo Cheesecake, and she seemed to be ok with that. Let’s talk about this cheesecake – it’s ridiculously good. 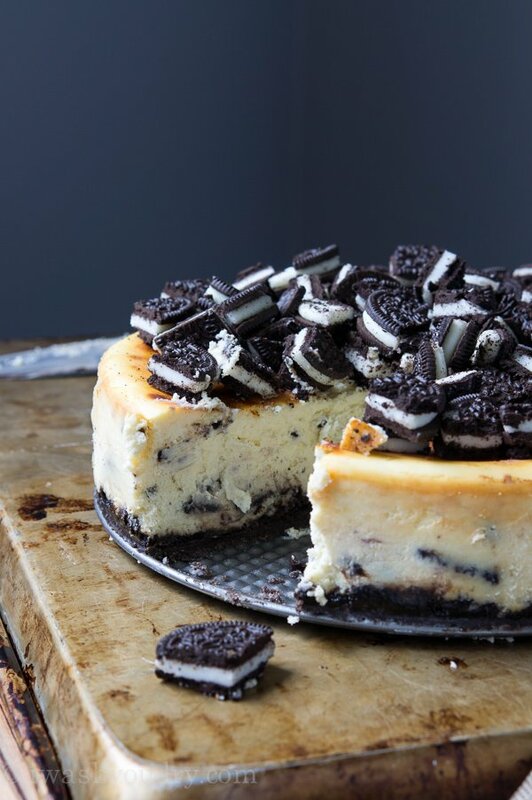 I know there are Oreo Cheesecakes out there, but the idea for this came to me after my husband and I shared an Oreo Cheesecake Blizzard from Dairy Queen. So it’s different. Actually, I used plain Greek yogurt as opposed to sour cream in this recipe, which bulks up the protein… ok, who am I kidding, this thing has 4 bricks of cream cheese and nearly 2 and a half boxes of Oreos inside of it. If you’re going to make this, just realize you’re going to indulge. Share a slice or bring it to a party, you’ll be labeled a hero because it’s seriously that good! 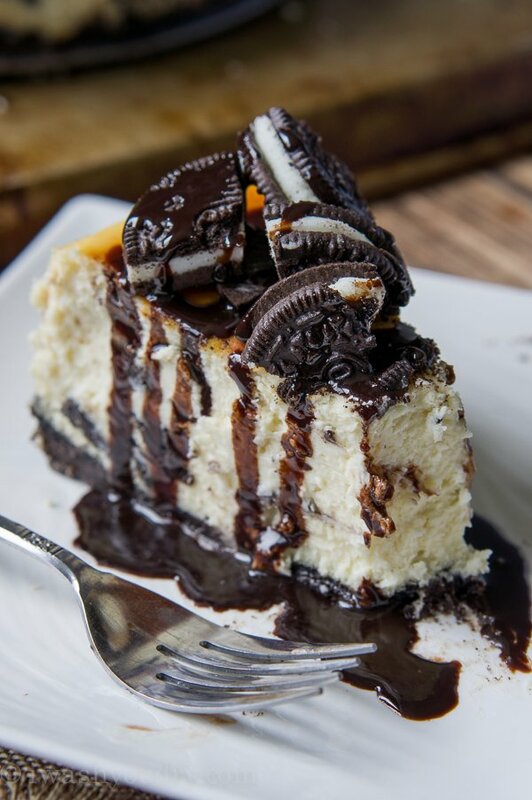 Cheesecakes can make magical things happen. 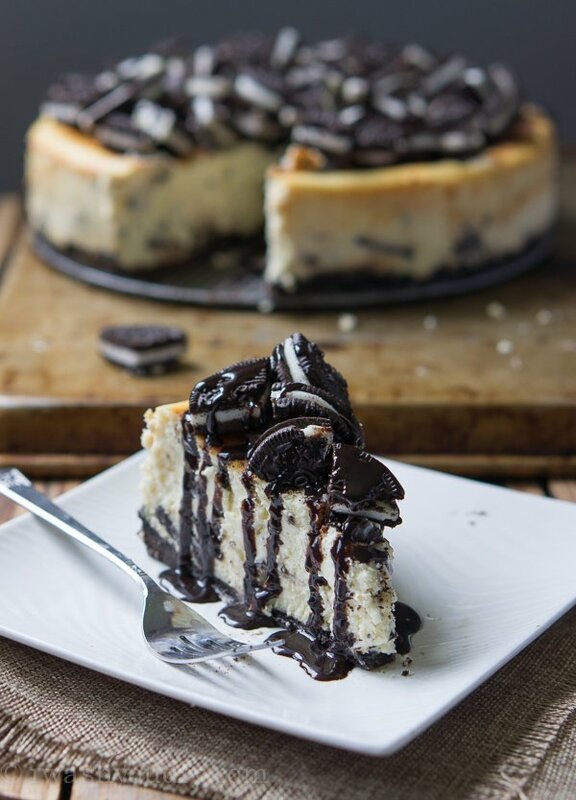 Oreo Cheesecake boasts a crispy Oreo crust and a creamy cheesecake that's infused with even more chocolate and cream cookie bits! Preheat oven to 350 degrees F. Place a 9"x13" pan on the bottom rack of your oven and fill half way with water. Position a rack just above the pan, in the middle of the oven. To make the crust, use a food processor to chop up the 20 Oreo cookies until they turn to a fine crumb, drizzle in the melted butter and pulse until combined. Optionally, you can use your hands or a rolling pin to crush the cookies. Press the crumbs in a 10" spring form pan in an even layer, and a little up the sides of the pan. Bake for 5 minutes, then remove from oven, set aside. In the bowl of your stand mixer, fitted with the paddle attachment, beat the cream cheese until smooth. Add the greek yogurt, sugar and vanilla and beat until combined, scraping down the sides of bowl when necessary. Add the eggs one at a time, beating in between. Gently fold in the chopped Oreo cookies, then pour into the spring form pan. Bake for 1 hour, or until the center of the cheesecake is only slightly jiggly. Turn the oven off, and crack the oven door open slightly, letting the cheesecake rest inside the oven for 1 to 2 hours. Let cool on counter top until room temperature, then refrigerate (covered) for 2 hours. Run a knife along the edges of the cake to loosen from the spring form pan. Gently unlock it and clean up any rough edges before topping with the remaining chopped Oreos. Serve with a drizzle of chocolate syrup if desired. Enjoy! I like to keep the spring form pan around the cheesecake whenever I'm not serving it, this will help protect it, and makes it easy to cover while in the fridge. 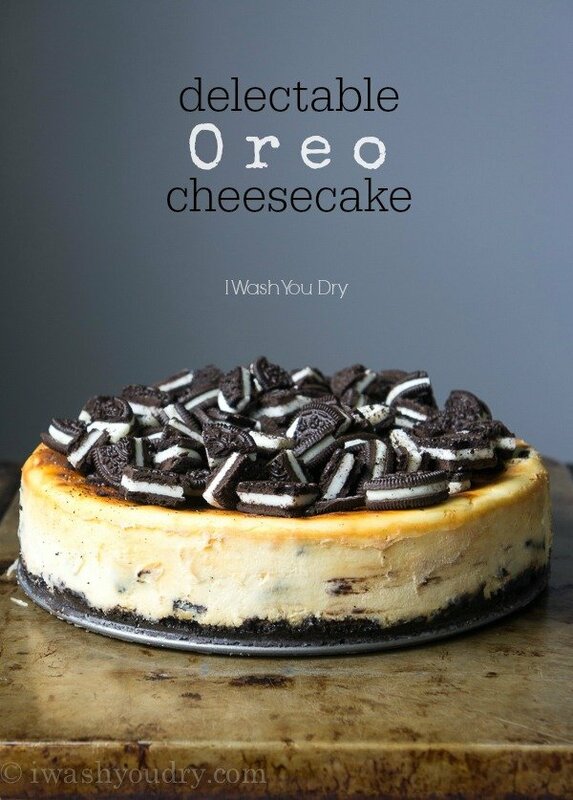 0 Response to "Oreo Cheesecake"